When it was announced last week that the World Series of Fighting would be changing its name to the Professional Fighters League and introducing a 10-month league format to mixed martial arts, complete with a regular season, a post-season playoff tournament, $1 million payouts to the champion of each of seven weight classes, and (perhaps most significantly) guaranteed monthly salaries for all its fighters, the MMA world was full of both wonder and questions. For example: How much would those salaries be? Would the contracts of the more than 100 fighters currently signed with WSOF roll over? How many of those fighters would choose to stay? And, perhaps most importantly, given the seismic shift in format, what would happen to WSOF’s incumbent champions, men who labored and strived and bled their way up the ladder only to discover once they got to the top that they’d have to start again at the bottom along with everyone else? Men who discovered that the rules had been changed just when they’d mastered the game? Would heavyweight champion Blagoy Ivanov just sit back and accept having his belt taken away and allow himself to be tossed back into the pool with all the little people? Would welterweight champ Jon Fitch? Or featherweight Andre Harrison? How about bantamweight Bekbulat Magomedov? 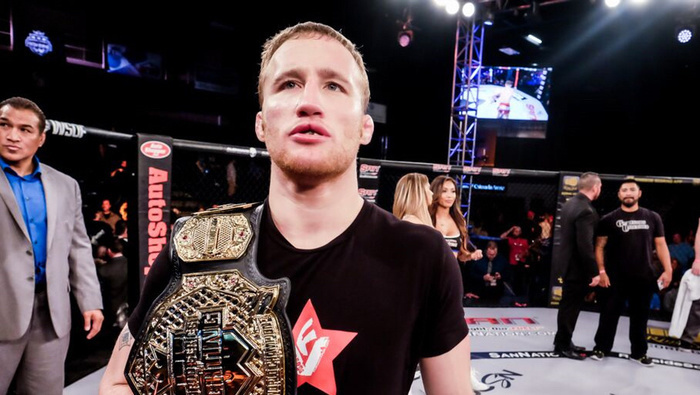 While there’s no word yet on what plans those fighters may have, it now looks like at least one WSOF champion will be forgoing the chance at the PFL’s million-dollar championship purse for a shot at greater MMA glory. 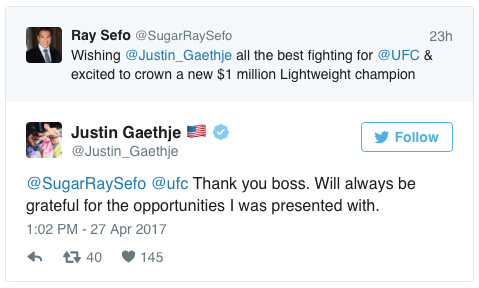 Yesterday former WSOF president-turned-Professional Fighters League President of Fighting Operations Ray Sefo broke the news on Twitter that undefeated lightweight champion Justin Gaethje, who has been with the WSOF since 2013, will be taking his talents to the UFC, where perhaps less lucrative, surely more renowned, and undoubtedly more dangerous waters await him. While there’s been no confirmation yet that what Sefo said is true, either from Gaethje or the UFC, Gaethje did retweet his (former?) boss’ message along with several other UFC-related Tweets, and a UFC official told MMAJunkie yesterday that while no contract has been finalized yet, negotiations between the promotion and Gaethje are ongoing. Such is the promotional angle of the Professional Fighters League, now given a new urgency by the departure of its greatest asset: Any man can be a king! Justin Gaethje may have just given his former promotion the greatest of all possible gifts.